I’m back. It’s really great to be back :). I ended up being away a lot longer and doing a lot more traveling than the originally planned 14 hours. Unfortunately, my travels weren’t of the pleasant variety and as a result, I haven’t knit a stitch the entire week I’ve been away :(. But, like I say, it’s great to be back. Now, we have a little business to discuss. 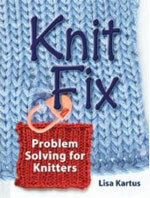 I was recently introduced to a new book from Interweave Press called Knit Fix: Problem Solving for Knitters by Lisa Kartus. The beauty of this book is that it illustrates and describes knit fixes that we’ve all “un-vented” during all those nights of blood and sweat and tears! Remember the first time you had to drop a few stitches to fix a mistake, and then pick them back up? You read about people doing it all the time, you see magnificent before and after pictures, but, really, how the hell do you do it?!? This book shows you how, step by step – ahhh! I think it would be a real gem for a beginner knitter. In an effort to get the word out about this book, Interweave has organized a pretty action-packed blog tour, and I’m happy to be a part of it! Below, Lisa asks me some questions about my knit fixes. I hope you enjoy my answers ;). Lisa: Your knitting is beautiful. When did you learn to knit? From whom? Me: I learned to knit about two years ago. It’s actually a funny story, because I was this close to becoming a crocheter! Two years ago, I had gone to a baby shower for a co-worker of mine, and someone gave her a beautiful handmade baby blanket. Talk about making everyone else’s gift feel inadequate! My measly $30 gift certificate to amazon.com was all of a sudden nothing more than a piece of paper in an envelope. I admired the blanket very much and decided that I, too, would like to make such personalized and beautiful gifts. The following weekend I went to my local Barnes & Noble, and picked up Pam Allen’s Knitting for Dummies. The book appealed to me because many of the techniques were taught in the form of swatches, without forcing a commitment to a big and possibly expensive project. Two “Pounds of (acrylic) Love” and a set of aluminum straights from the local arts & crafts store completed my learning experience. It was months later that I grasped the extent of knitting information on the web; my initial stitches were guided by Pam’s book alone. The twist to this story is that as I learned to knit, I realized that the handmade blanket I had admired so much at the baby shower was actually crocheted! It was a standard issue granny-square blanket, in fact. It was serendipity that I didn’t know knitting from crocheting back then, and pure chance that I stumbled on the knitting books first! Live and learn! Lisa: What was your very first knitting mistake? How did you fix it? Did you ever make that same mistake again? If so, did you use the same fix or a different one? Me: My very first knitting mistake was a skipped stitch. I was working on a baby blanket which had a large garter stitch section in the middle. I didn’t keep continuous count of the hundreds of stitches there, but at some point I finally counted – one was missing! I pored over my work and found the offender, simply hanging out there in midair, at least 5 or 6 inches below where I was working. It hadn’t dropped any further, fortunately, so I secured it with a safety pin, threaded a regular needle, and stitched it to the surrounding fabric. I reestablished the stitch count on the next row by skipping a k2tog. I don’t think I’ve skipped stitches since then. As you explain on p.29, this is typically a mistake that requires unraveling. Fortunately, the skipped stitch in the baby blanket was located on the edge of the garter section, where I could implement a fix without unraveling :). Lisa: Do you usually catch a mistake right away? If so, how? For example, counting stitches frequently, reading your stitches after you’ve finished a row? Me: I think I catch stitch mistakes right away, or at least fairly quickly. At the onset of a knitting project, I very consciously examine the pattern and my work. I don’t blindly follow a chart, I investigate – oh, this goes here, and this goes there, and this becomes a yarnover, and so on. Then, even if I’m using a chart, I can see if something’s the matter. If I’ve noted that a certain k2tog always occurs on the edge of some section, I’ll look twice or even three times when it doesn’t end up there, for some reason. Other mistakes are a little more tricky to catch at the onset, especially when it comes to knitting entire garments. For instance, how can we know that the back of a sweater neckhole will droop before actually knitting it? That’s a more difficult fix to implement on the spot. Lisa: I notice you frequently revise patterns. Do you plan your revisions, or do they come to you while making the project? Me: Some pattern revisions have to be planned in advance – using a yarn that knits to a different tension and modifying the finished dimensions of a garment come to mind. Other revisions are more on the go – maybe the yarn looks to be running low, so I make the sweater with 3/4-sleeves, or knit the buttonbands in a different color. I find that it’s important to critically examine your work throughout the knitting process, to catch mistakes and discrepancies as early as possible. So often I hear a knitter say, “the sweater back looks to be really big,” but do nothing about it! Two weeks later, a sweater to fit a woolly mammoth, no surprise. At the first sign of a sweater’s back being too big, I would hold it up against myself, or measure it against another sweater. Ten seconds of work will save me a whole lot of frustration later. Lisa: What’s your knitting philosophy? I opt to be very picky :). Because I’m very much a process knitter, I like the final product to be as perfect as possible. Most often I don’t mind ripping out large sections of my knitting if I know reworking them will make a better final product. I take many of the shortcuts you describe in the book to fix my knitting, but I certainly fix my knitting if I catch a mistake and it’s within my power to correct it. Thank you, Lisa, for asking me these questions! If you’d like to visit other blog tour spots, check out the schedule. Many wonderful blogs will be visited, and even a podcast! Next up (tomorrow): Craftzine! Ooooohhhhhh, Aaaahhhhhh, that would be like having all the helpful hands at the yarn shop in a book! Must. Go. Buy. It! Welcome back! Sorry to hear you didn’t get much knitting done while you were away, but I did enjoy reading your perspective on fixing mixtakes. I have to say, I was not surprised at all! Hey! I’m SO glad you’re back, and it’s nice to know that there are other process knitters out there who check every stitch to make sure it’s perfect. I think that’s what makes your work so beautiful. Just wanted to say thanks for your blog – you inspired me to start one of my own! Welcome home! Sorry you didn’t get to knit while you were gone but think of how much knitting you get to do now that you’re back. YOU’VE ONLY BEEN KNITTING ABOUT 2 YEARS??? That is truly amazing. I am truly amazed. Wonderful. Wanna run for President? No, I wouldn’t wish that on anyone. Welcome home from your travels. Now, relax. What a fantastic book. I love your knit philosophy! I will definitely be looking into it! I like the idea of a blog tour. Sounds like a great way to get to know other bloggers. >So often I hear a knitter say, “the sweater back looks to be really big,” but do nothing about it! Two weeks later, a sweater to fit a woolly mammoth, no surprise. Welcome back! Missed my daily reads. What a great interview and the book looks very interesting. I also enjoy hearing your opinions and philosophy. Well, I’m convinced. This book needs to live at house. I think one of the most important (but most difficult) things to learn as a knitter is that you’ll always be happier (perhaps not in the most immediate term, but ultimately) if you fix what is fixable. It took me a long time to realize that. I’m not saying I don’t do a lot of swearing when I realize a mistake requires a time-consuming fix, but at least I pretty much always do it now. Ultimately it has resulted in far fewer wooly mammoth sweaters or the equivalent. Nice interview! The book sound great.